Henry Holt and Co., 9781627793421, 400pp. "With a nimble style and an eye for leaden prose . . . Kalder's work is quite an accomplishment, and is the one book people interested in the terrible writing of dictators should read." "Kalder turns indigestible beef jerky into foie gras. . . . In addition to being highly entertaining, [The Infernal Library] is a cautionary tale about the capacity of societies to be wooed by foolish demagogues spouting gibberish." "A compelling examination of why bad minds create bad writing, and therefore a valuable read for anyone interested in literature—or the world, in fact. Every writer is certainly a little dictator, and every dictator, it seems, a little writer. Kalder’s dry humour makes The Infernal Library a fun tour de force through the mad history of the 20th century and the present." "An overwhelmingly powerful reminder of 20th-century misrule, and of just how delusional human beings can be—especially if they’re literate." "This about the most discomforting book I’ve read in the past year. Never mind Trump and never mind Twitter: Daniel Kalder demonstrates that words themselves, and the escapist spells we weave with them, are our riskiest civic gift. Kalder’s claim—that he has read the deathless prose of tyrants so we don’t have to—does not go nearly far enough. 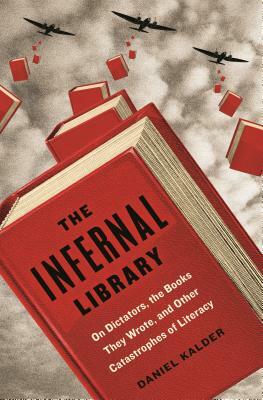 The Infernal Library sweeps aside the ideas and intentions of its subjects (Mao, Hitler, Stalin, and their imitators) and reveals what’s really been going on: an epic, world-transforming battle between words and reality, between people as they are and people as we would like them to be." "A perverse feat of literary endurance." "A fascinating study. . . . Partly an enjoyable romp, but mostly a somber sidelong-glance history of 20th-century totalitarianism." "Kalder spent years reading the works of dictators . . . teasing out some fresh insights and analysis . . . [which now] seem all too relevant at a time when authoritarianism is on the upswing and terrible people keep writing (or getting ghost writers to write) terrible books." "I enjoyed this book a great deal. . . . A rather snappy read." "Hugely compelling. . . . Kalder has really dug deep into the minds of these infernal texts' creators, and thus delivers some truly entertaining insights."